gon; Jesse, of Atkinson, and Frank, now in Portland. Mr. Akin married (second) in Atkinson, March, 1902, Miss Luella Boehme, a native of Sangamon county, Illinois, whose father, Conrad Boehme, was one of the earliest railroad men in Holt county. Mr. Boehme is mentioned at considerable length elsewhere in this work. By his second marriage, Mr. Akin became the father of two children, Erma and Dell, junior. Mr. Akin was living on his ranch at the time of the notable blizzard of January 12, 1888. Seeing it coming, he got the cattle to their sheds before the storm broke, but spent most of the day shoveling snow, which drifted into the sheds so fast that the cattle were lifted on the drifted, trampled snow until their backs touched the poles of the roof. For a time after moving on his ranch in Holt and Rock counties, Mr. Akin lived in a sod house. The family used hay and big hay-burners (still in use in the sand hills), though they never used it twisted as it had to be prepared before the introduction of the hay-burners into the state. Deer, antelope and elk were to be found when Mr. Akin first came to Nebraska, and there are still buffalo on the Yankton agency, Mr. Akin at one time seeing a buffalo cow that had strayed from the heard and passed through Holt county. In an early day, Mr. Akin was caught in the river in a hail storm so severe that the bark was torn from many trees, and they were killed. Mr. Akin relates humorous sides of the Indian scare of 1881. Soldiers from Fort Randall were shooting off condemned ammunition, and when a mail carrier jokingly asked them the cause, they soberly remarked to him that "Hell's broke loose.'' Without waiting to hear more, the questioner hastened to spread the alarm through the country-side, with the result that part of the country was almost depopulated, and some of the fugitives never returned to their homes. Mr. Akin and a Mr. Parker rode toward the reservation to investigate the cause of the rumor, notwithstanding Mrs. Parker's tears because she thought her husband was going into dire danger. Upon reaching the river, the two picketed their horses, and swam across to Mr. Lamoraux's (a squaw-man living on the north side of the stream), and found there was no foundation for the scare. Mr. Akin knew "Doe" Middleton, "Kid" Wade aud others of their gang, and spent freely of his time and money in the effort to help bring to justice the murderers of Conuty Treasurer Scott. In spite of threats, he kept at work on the case as long as he saw a hope of carrying out a successful prosecution. Mr. Akin is one of the best known men in the county, and, during his active life, has been identified with its measures of progress and advancement. He is well liked and popular, and has numerous friends. This gentleman has resided in Boone county, Nebraska, for over twenty years, becoming familiar to all there, and he occupies a foremost position among them as an energetic agriculturist and public-spirited citizen. He is a representative farmer, owns a fine estate, and makes his home in Ashland precinct. Thomas A. Bunker was the eldest of two sons born to Obadiah and Parmelia Bunker, he first seeing light on July 13, 1842. His birthplace was in Caledonia county, Vermont. The Bunker family trace their ancestors back to the coming of the Mayflower, and our subject is the only member of his family now living, his mother departing this life in 1859, and his father in 1888. About 1862, the family removed to New Hampshire, but shortly afterwards Thomas ruturned to his old home in Vermont, where he received his education, later going to Wisconsin, where he worked in the pine woods for some years. While there he was married in 1869 to Miss Emma Hoyt, and they settled in Iowa, and engaged in farming and stock raising. About 1871, they went to Howard county, Iowa, remaining up to 1889, at which time they migrated to Boone county, purchasing land in section twenty-six, township twenty-one, range seven, which has been their home farm up to the present time. Mr. Bunker has made a success of faming, and is now owner of one of the finest farms in Boone county. He has a very pleasant home. They had one daughter, who died in 1876. In reviewing the history of the Bunker family, going back to the Pilgrim days, three brothers came over on the Mayflower, landing at Pilgrim Rock. One went to sea and was lost. One entered the revolutionary war and after returning from war, disappeared and all trace of him was forever lost. The remaining brother located in Massachusetts, and the grandfather of our subject settled in Vermont. He was a captain in the militia of Vermont in his day, and noted as the strongest man in Caledonia county, living to the ripe old age of ninety-eight years. The father and mother of Mrs. Bunker are deceased. She has one brother and one sister, the Hoyt family also tracing their descent from the Pilgrim days. Valley Bank, the first financial institution in the county. He was interested in real estate during the same period, and was instrumental in getting many of the early settlers located in the county. In 1881, he moved to Wayne, with the change of the county seat, and bought the Bank of Wayne County, which was consolidated with the Logan Valley Bank. This was later reorganized into the First National Bank, and of this Mr. Bressler owned a controlling interest, and served as president until 1889. Selling part of his holdings at this time, he became vice president, and has held that office since. He holds large areas of real estate in Wayne county, and deals in real estate and farm loans within a wide radius of Wayne. He is the local representative of many non-resident owners of lands in the west, attending to their interests as assiduously as he would his own. Mr. Bressler was born in Huntington county, Pennsylvania, January 14, 1849, attending only the county schools. His parents, Daniel and Mary Ann (Tannyhill) Bressler, spent their entire lives in The Keystone State. A brother, Anderson Bressler came to Wayne in 1898, and is engaged in the insurance business. Mr. Bressler was married in Dakota county, Nebraska, Ju1y 21 1880, to Miss Julia Fair, a daughter of Mark and Jane Fair. Six children have been born to Mr. and Mrs. Bressler. They are: Maude, George (who died at the age of two and a half year's), Ruth, Kate, John T. and Dorothy. Mr. Bressler was living in Nebraska during the time of the grasshopper raids. He lost crops several years and his crops were entirely destroyed in 1874. He passed through three of the most notable blizzards of the last forty years--those of April l2 to 14, 1873; October 15 to 17, 1880, and that of January 12,1888, in which he was for a few minutes bewildered and lost in getting his children home from school. Mr. Bressler reached the country before the Indians were entirely subdued, and when a neighbor, named Munson living but two miles distant, was killed and scalped by them, he realized the danger was great and sought safety for a few weeks. Mr. Bressler is a leading republican, high in the councils of his party. He was a delegate to the convention at St. Louis that nominated McKinley in, 1896, and was Nebraska's member of the notification committee that officially carried the news to Canton. He was appointed one of the five government directors who represented the United States on the board of the Union Pacific railroad when the government withdrew from the management. He served one term in the State Senate being elected in 1894, and was elected Mayor of Wayne in the spring of 1909. Mr. Bressler is a member of the Odd Fellows' and Masonic Lodges of Wayne, and the Chapter, Council and Cominandary of Norfolk. John W. Busch, retired farmer and an old settler of Colfax county, Nebraska, is a prominent and substantial citizen of Schuyler, where he and his family now reside. Mr. Busch has lived in Colfax county for the past forty-two years or more, and has been persistent and faithful in his duty to his home state and county, and well deserves the prosperity and comfort he now enjoys. Mr. Busch is a sturdy son of Germany, his birth occurring in that country, January 1, 1848. He is a son of Christ and Dora (Mueller) Busch, and was eldest in a family of seven children. He has one brother residing in Howells, Nebraska. One brother died in Germany. He has three sisters in Colfax county and one in Germany. The parents are deceased, their deaths occurring in their native land of Germany. In the fall of 1867, Mr. Busch came to America, locating in Wisconsin, where he followed the occupation of farming. In the spring of 1869, he came to Colfax county, and bought eighty acres of good land in the east half of the northwest quarter of section four, township seventeen, range three, which remained his home place for thirty-four years. On January 14, 1873, Mr. Busch was married to Miss Mary Brum, who was also a native of Germany. Mrs. Busch died in January, 1884, survived by her husband and five children: George, who is married and living in Schuyler; Minnie, wife of William Schuldt, has two children, and resides in Schuyler; Frank, also married, has one child, and lives in South Dakota; and Johnnie and Clara, both of whom died in infancy. Mr. Busch is a democrat in politics, and in 1894 was elected county treasurer, serving his constituents well for two terms. He also served in the various offices of his school district, number thirteen, for many years. On April 18, 1884, Mr. Busch was united in marriage to Anna Schebal, who was also born in Germany. Mr. and Mrs. Busch have one child, Lilly, who is the wife of Reverend Carl Wilhelm, who reside in Dorrance, Kansas. Mr. Busch has been prosperous and successful, and owns six hundred and forty acres of good farm land. In 1903, he retired from the farm, and moved to Schuyler, where he purchased a fine home, which is the present dwelling place. Mr. Busch is one of the earliest settlers of his county, has passed through all the discouragements and hardships incidental to pioneer life, and is widely and favorably known. He is a director in Schuyler National Bank, also of Richmond State Bank, president of Schuyler Savings Bank, and a stockholder in Howells State Bank. his home, and has done his share in the developing of the agricultural resources of this section of the county. Mr. Christon lives on section thirty, township twenty-seven, range eight, where he and his family enjoy the respect of all who know them, and their friends are many. Mr. Christon was born April 14, 1876, in Carrol county, Illinois and is the son of Peter and Anna M. (Jensen) Chirston, both natives of Denmark, the father being born in 1856, and died in 1895. Mr. Christon's father came to Nebraska in the very early days and took up a homestead in section thirty, township twenty-seven, range eight, Antelope county, where our subject now lives. He first built a board shanty, and here they experienced great difficulty in keeping warm, having to burn cornstalks to keep the children from freezing to death. In 1904 they suffered the loss of almost all their crops by reason of the severe drought of that year. On March 4, 1901, Mr. Christon was united in marriage to Miss Ernestine Iburg, and Mr. and Mrs. Christon are the parents of four children, whose names are as follows: Carl, Irvin, Marie and Walter. Mr. Christon has made a good home, and is justly entitled to the competency he has attained as the result of constant and intelligent effort. He has done his share in the developing of the country as a pioneer settler, and he and his family are enjoying the respect and esteem of a host of friends and acquaintances. Ralph J. Jewell, marble dealer at Plainview, Nebraska, is a typical westerner -- energetic, sturdy and reliable. He first came to Nebraska in the fall of 1878, and filed on a timber claim, and a year later filed on a homestead claim, moving on it in March, 1880. The land lay in Antelope county, five miles southwest of Plainview, which then consisted of but a few houses. In 1888, Mr. Jewell moved to town, and for two years was proprietor of a hotel, and then went to Pierce, where he learned baking, and was in business there one year. He was in the dray business a few years, and then rented a farm, one mile west of Plainview, which he cultivated some five years, spending his spare time in the sale of monuments and tombstones, which later became his regular vocation. Moving into town, he built a bakery, and worked at that business until the building burned. He rebuilt, and for three and a half years was engaged in furnishing the town people their daily bread. Mr. Jewell again entered the marble and granite business, in which he has since been engaged. In 1904, he formed a partnership with Harvey Stocking, and opened an office in the main part of town, each bringing to bear in the business a reputation for energy and reliability. In 1910, he sold his interest, and the following spring purchased and took control of the entire establishment. Mr. Jewell was born in Litchfield county, Connecticut, July 2, 1852, and lived in his native county until 1869. He lived at Canaan, Connecticut, two years, and then moved to Denison, Iowa, where he engaged in farming until he migrated to Nebraska. He is the son of Milo and Sarah (McLava) Jewell, the former of English, and the latter of Scotch-Irish descent. Mr. Jewell was married in Dennison, Iowa, November 22, 1876, to Miss Hattie Bush daughter of Drury and Maria (Hutchens) Bush. The mother of Mrs. Jewell died at her daughter's residence. Of six children born to Mr. and Mrs. Jewell, four lived to be grown: Clara Belle, the eldest, who married Loren William Box, they having two children, Ralph and Gladys, died August 22, 1906; Elmer is owner of a farm, three miles from Long Pine; Fred ran a restaurant and bakery at Ute, Iowa, for a time, and then spent a year in New Mexico, returning to Ute in 1911; Viola, who is an expert trimmer, married William Smith, who is a popular clerk in Plainview. Mr. Jewell is a republican, and is affiliated with the Independent Order of Odd Fellows and the Modern Woodmen of America lodges, and, with his wife, is a member of the Congregational church. During the severe blizzard of January 12, 1888, and the memorable hailstorm of June, 1890, Mr. Jewell was living in town, and so escaped the dangers and discomforts of those living in the country, who had cattle out in the storm to be rescued. One of his most discouraging experiences occurred during his first year's residence in the west. To get wood for fuel, he had to go nine miles beyond Neliegh, a distance of about thirty-five miles. On the return trip, the axle-tree of his wagon broke, but a nearby settler loaned him a wagon, on which to get his load home. The return of the borrowed wagon necessitated fifty miles more travel, which, together with delay and repairs on his own vehicle, made it a very expensive load of wood. Rather than risk the time and expense, the family, after that, burned hay. Mr. Jewell has traveled much over northeastern Nebraska, has a wide acquaintance with the country and the sturdy people who have developed it, aud enjoys their confidence and respect to a degree that few have done who have had as extensive dealings with so many and such a varied class of citizens. as one of the leading old settlers. His home is now in Grand Island, Nebraska, having moved there a short time ago. Albertes M. Hoes is a native of Maryland, born on July 28, 1851, and, with his parents, settled in northern Illinois when he was a child of six years. There he grew to manhood, and spent some time in different parts of the country, living in California with his family for a number of years. He is a brother of John H. Hoes, whose sketch appears in this volume. Mr. Hoes first came to Howard county, Nebraska, in 1883, settling on a tract of land on section three, township fourteen, range nine, on May 6. He developed a good farm, passed through the pioneer period here, made his place one of the paying stock and grain tracts in his section, and, with his family, is prominent among Howard county's well-to-do old-timers. On January 16, 1881, Mr. Hoes was married to Idella McBride, the ceremony taking place in California. Mrs. Hoes is a native of Ohio, and both her father and mother are now deceased. Mr. and Mrs. Hoes had no children of their own, although they have raised two adopted children, one a girl, now the wife of Clyde Applegate, well known in Howard county, and the other a boy, now married and living in Polk county. Our subject takes a lively interest in all county and state affairs, and has held numerous precinct offices. As an old settler of Valley county, Nebraska, an agriculurist of untiring energy and perseverance, and worthy citizen, the gentleman here named needs no introduction to the people of his locality. He has spent over twenty-four years of his life in their midst, has gained a host of stanch friends and incidentally acquired a good home, and placed himself in a position to be counted among the substantial citizens of this region. Mr. Murschel was born in Iowa City, Iowa, April 2, 1868, and was fourth of five children in the family of John G. and Charlotte (Doll) Murschel, who had three sons and two daughters. The parents died in Iowa City, both passing away in the year 1899, survived by four of their children: Albert Murschel, who lives in New York City; George J. lives in Santa Clara, California; and Emma, now Mrs. Emma K. Ahrens, resides in Iowa City, Iowa. Otto Murschel, the principal subject of this sketch, lived in Iowa City until attaining the age of eighteen years. He received the usual schooling, and in his eighteenth year left his Iowa home, going to Omaha Nebraska, remaining there for six years. Mr. Murschel, prior to his eighteenth year, worked in a drug store, and when in Omaha was connected with the barber trade. In his twenty-fourth year he returned to Iowa to attend business college in Iowa City, and took a commercial course there for one year, returning to Omaha when he had completed same. Shortly after, on May 10, 1893, he came to Ord, Valley county, taking up his occupation as barber. He then engaged in the restaurant and bakery business, in which he continued until the fall of 1909. Mr. Murschel, during his residence in Ord, has been actively connected with the democratic party, and also actively engaged in the upbuilding of Ord and also of Valley county, and is a young man progressive along all helpful lines. He was a member of the city council in 1902, served as city clerk of Ord in 1903, and creditably filled the important office of mayor for a period of three years, taking the chair in 1904. In 1906 he was a candidate for county treasurer, and defeated. In the fall of 1909, he was nominated by his party for county clerk, being elected in a republican county, and is the only county official of democratic faith. Mr. Murschel was united in marriage in Council Bluffs, Iowa, January 3, 1895, to Miss Anna Hansen, who is a native of Pennsylvania. Mr. Murschel has always stood for progressive, modern improvements in city affairs. Christian Ender, well known and highly respected as a leading citizen of Howard county, Nebraska, resides on section five, in Elba precinct. He is a truly successful agriculturalist, and his entire estate bears evidence of good management, thrift and prosperity. Mr. Ender was born in Switzerland on November 1, 1845, and the first six years of his life were spent in that country, then with his parents and two brothers he came to America, locating at first in Washington county, Wisconsin, where they settled on a farm and remained for about thirteen years, during which time our subject received his education, attending the common schools only. The old folks remained in Minnesota from the time of settling there in 1864, the father's death occurring in 1907, while the mother still makes it her home. braska, on the North Loup river, and at that time Mr. Ender took up a pre-emption claim on section five, township fifteen, range eleven, and proved up on the tract. Later he filed on a homestead on section six, also proving up on this. He had been married in Omaha in April, 1869, to Miss Bertha Johnson, of that city, and, after filing on his homestead, his wife and their two children held the claim down and started to build up the home while he remained in the service of the government. During Mrs. Ender's career as a pioneer here, she met with numerous frontier experiences, at various times having trouble with the bands of Indians who infested the country, and had she not been a woman of more than ordinary spirit, would have become intimidated by these hardships, and given up the struggle, but she stuck to her little home until joined by her husband, who went out of the army about 1874, and settled on his homestead with his family, which they developed together into a productive and well-improved farm. 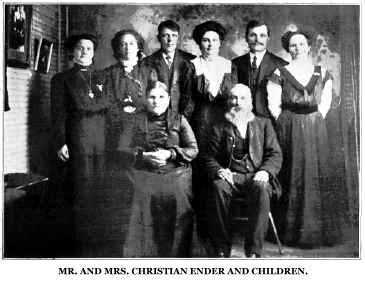 Mr. and Mrs. Ender have had eight children, six of whom are now living, namely: Christian, III., William, Margaret, Mary, Sarah and Annie, all married and living in Howard county, the entire family being well known and highly respected as worthy and progressive citizens. Portraits of Mr. and Mrs. Ender and their children appear on another page of this volume. Mr. and Mrs. Christian Ender and Children. Christian H. Ender, III, was born in Omaha, February 6, 1870. His early education was received in Howard county, and he has spent nearly all his life on a farm, during his boyhood helping his father in carrying on the home place, and since then owning extensive farming interests on his own account. He attended the U. B. College at Gibbons, Buffalo county, for six weeks, remaining with his parents until his twenty-ninth year, then starting for himself, purchasing land on section eighteen, township sixteen, range eleven, which he has converted into a model farm. He has erected fine buildings of all kinds, and engages in stock and grain rasing on a large scale. Mr. Ender is proprietor of considerable land, his home farm being admirably situated on the North Loup river, making it one of the best located in that section of the country for the purpose to which he has it devoted. During his younger years, Mr. Ender learned the jeweler's trade, and has done considerable of this work in his section, known far and wide as the "Country Jeweler" of this locality. Mr. Ender was married in 1889 to Rose Elizabeth Nelson who is a native of Illinois, coming to York county, Nebraska, with her parents in 1881. They have a family of five children, named as follows: Edward A., William Glenn, Ruth, Alice and Bertha, all bright and interesting young people, and all living at home at the present time. Mr. Ender has always taken an active and leadmg part in the affairs of his vicinity. He was director of school districts number eleven and fourteen for thirteen years during his early residence in his present locality. He at one time held the office of president of the Independent Telephone Company, and at present is shipper of the Farmer's Co-operative Society at Cotesfield. It is impossible to give a complete history of north-eastern Nebraska without including a sketch of the life of William Nicolay, who is one of the most prominent of the old settlers of this region. Mr. Nicolay owns a farm in section thirty-one, township twenty-three, range two, but has retired and lives in Battle Creek where he and his family enjoy the high esteem and respect of all who know them, and their friends and acquaintances are many. Mr. Nicolay is a native of Germany, his birth having occurred August 24, 1847, in the province of Holstein; he is a son of Carson and Margurite (Tyson) Nicolay, both natives of Holstein Germany. Mr. Nicolay grew to manhood in his native land, receiving the usual school advantages, and after reaching the required age, served in the army of the German Empire, participating in the war between France and Germany in 1870. In 1881, Mr. Nicolay left the fatherland, sailing from Bremen to New York on the steamship ''Bremen;'' he had heard such glowing accounts of the prosperous country of America, and of the cheap land to be obtained there, that he decided to try his fortunes in the New World. After landing in the United States, Mr. Nicolay proceeded westward to Iowa, remaining there one year. In 1884 he came to Madison county, Nebraska, where he bought one hundred and sixty acres of fine land, known as the Fannie Bauer homestead, and "batched" it until 1888. Mr. Nicolay now owns three hundred and twenty acres of good land, which is well improved, and has a fine orchard of two acres. Mr. Nicolay was united in marriage, October 10, 1888, to Miss Catherine Borcher, a native of Germany, and a daughter of Deithlif Borcher, who was a native of Germany. Mr. and Mrs. Nicolay are the parents of five children whose names are as follows: Willie, Bertha, Marguret, Theresa and Nina. Mr. Nicolay and family are well and favorably known in the community in which they reside, and have many good friends and acquaintances. They are members of the German Lutheran church, and Mr. Nicolay is a democrat. Mr. Vandenberg passed through an early period of Nebraska history and was one of the organizers of school district number one hundred and eighty-eight serving for some time as director of the board. He and his wife made their home on the homestead for many years and became the owners of seven hundred acres of well improved and equipped land. For twenty-five years he specialized in pure bred Poland China hogs, having one of the oldest established herds of the big type of these hogs in the west. In 1907 he retired from farm life and moved to Sargent where he purchased a comfortable home which is now the residence of the family. They are well known and highly respected as a representative family. James Sullivan, a prosperous retired farmer of Hartington, was born November 9, 1840, seven miles from the city of Wexford, Ireland, in the county of the same name. His parents, Daniel and Ellen (Doyle) Sullivan, emigrated to America in 1858 with their three sons and one daughter, sailing from Liverpool to New York in a steamer of the Black Ball line, being three weeks and three days on the ocean voyage. They landed at Castle Garden the latter part of June and arrived at Madison, Wisconsin, their destination, the 6th or 7th of July. The family resided in Madison, where the three sons, of whom James was the youngest, found work to support their aged parents, the father being an invalid and unable to perform hard manual labor. For a few years, James was engaged in farm labor, and then farmed on shares for three years before coming to the west. Mr. Sullivan migrated to Nebraska with a colony of friends, driving across the country in a prairie schooner. They crossed the Missouri river at Sioux City and reached St. James on the 4th of July, 1866. He settled eight and a half miles east of where Hartington is now located, at the village of Wanpanica, now deserted by all its inhabitants. leaving only a name. The school later established on Mr. Sullivan's farm perpetuates the Indian name, being called the Waupanica school. Mr. Sullivan filed on a homestead and later on a timber claim, to both of which he perfected title; to these he later added forty acres, making a fine tract of three hundred and sixty acres of fine farming and grazing land. Grasshoppers proved to be a pest from the very start, and seriously reduced the crops raised, some years destroying every thing that had been sown. On one occasion at harvest time Mr. Sullivan, who had been wearing two shirts during the chill of the early morning, removed one as the day grew warm and left it on a shock of wheat; while the men were at dinner a cloud of grasshoppers descended, and when Mr. Sullivan looked for his shirt he found it eaten into shreads. They were not always so bad as anticipated; one spring the wheat in Mr. Sullivan's fields was a foot high when the pests arrived they began eating their way into his field. but after covering an acre or two, arose and sailed away on the wind. With favorable rains the wheat sprouted again and the entire field averaged forty-two bushels to the acre. The land in those days of virgin soil frequently produced forty-five or more bushels to the acre, and less than thirty was considered a poor crop. Mr. Sullivan's first dwelling was a log house covered with slabs and earth, but he soon built a more commodious dwelling in which he lived in comfort until retiring and moving to town in the fall of 1901. He owns a neat cottage residence in the south-west part of town, and having worked hard the early years of his life is now enjoying his reward and is taking life easy, free from worry or care of the morrow. Mr. Sullivan was married in Madison, Wisconsin, in November of 1865, to Miss Ann Lacy, who was born in the community from which Mr. Sullivan came. She was a daughter of Patrick and Ann (Bulger) Lacy who died in old Ireland before their children emigrated to the states. Mrs. Sullivan came to America with a brother who settled in Wisconsin, near Madison. Mr. and Mrs. Sullivan had six children born to them, four of whom are living; they are: Daniel, who is farming eight miles east of Hartington; Moses, lives in Laurel, Nebraska; Laura, wife of John Waltz, with whom our subject now lives, in Hartington; and John, who cultivates the home farm at Waucapana. Mrs. Sullivan died in January, 1911. Mr. Sullivan well remembers the worst blizzard that swept the country since the coming of white settlers, that of January, 1869. He had started for some posts he had bought of a neighbor nine miles from home, and was six miles from home when the storm overtook him. The snow drifted so badly that he lost the track he was retracing, and was in the storm from ten in the morning until two in the afternoon; driving was out of the question, so he led the team, and in doing so froze his hands until he feared he might lose them. He finally found himself at a neighbor's a mile and a half from home, and put his horses into the stable, where another belated traveler had already crowded his, packing eight horses into a space intended for only three. After resting himself and horses he again breasted the storm, anxious to get home where he knew his wife was worrying over his absence. He was stiff from cold from again leading his team, but the warmth of his home soon made him comfortable again. Waucapana was on the old Indian trail between Santee and Ponca, and at times from five hundred to a thousand of them camped near Mr. Sullivan's home. They were in the main good neighbors; true, they were careless with fire, and one season allowed the flames to get into a cornfield of Mr. Sullivan's, and burnt it off, but he found them less vicious than many of the early settlers pronounced them to be. He came home one day to find his house full of them, and his wife and child frightened nearly to death. He pretended to be very angry, and drove them from the house. His team, which in his haste he left untied, were frightened at their red blankets, and ran away; but, fortunately, circled around, and got back nearly to the house, where he caught them uninjured, with no damage done. Like most of the pioneers, Mr. Sullivan lived for a time in a log house which was later replaced with a frame structure. He made farming a success, accumulated a competency, and is now enjoying the fruits of a well-spent life. Reared a Catholic, he has with his family ever remained faithful to the church. In politics he was a democrat, and gives his support to all worthy candidates which his party honors as its leaders. He is a good citizen, a good parent, neighbor, friend, such men are a loss to the mother country in their emigration and a distinct gain to the newer country of their adoption. Oliver S. Wolcott, who for many years has been a resident of Merrick county, Nebraska, is well known all over the county as a prominent and worthy citizen. Mr. Wolcott is a Canadian by birth, born April 14, 1830, and was the youngest of three children in the family of Asa and Elizabeth Wolcott who were natives of Canada. The Wolcott family - father, mother, daughter Mary, and sons, Rodger and Oliver, moved from Canada to Kane county, Illinois, in the fall of 1840; the father died January 9, 1852. The family remained in Illinois for some years and finally became separated; Roger married and moved to Wisconsin. Oliver Wolcott, the subject of this sketch, was married to Miss Calista Harris, February. 4, 1852, in Kane county, Illinois, and about the fall of 1857, he, with his wife and one young son, Walter, moved to Lafayette county, Wisconsin, where, Roger Wolcott lived. Mother Wolcott remained in Illinois with her daughter Mary, but in a few months' time she also moved to Wisconsin, where she joined the boys. Mary married and moved to Galesburg, Illinois, where in later years she died. In the fall of 1861 Oliver Wolcott with his wife and four sons moved to Harrison county, Iowa; Mother Wolcott coming to make her home with them later on. Mr. Wolcott followed farming and stock raising and was a pioneer of Harrison county, Iowa. In March, 1878, Mr. Wolcott and his son Walter made a trip overland by team from Harrison county, Iowa, to Merrick county, Nebraska, with a view of obtaining land there, and returned to Iowa in the same way they had come. Later, Walter and his family moved to Central City. In June, 1880, Mr. Wolcott and family moved to Merrick county, Nebraska, going to their homestead farm fifteen miles northwest of Central City on the Loup river. Mr. Wolcott became an active, factor in the building up of his home county, and is known for his integrity and straight forward dealings. He is a quiet, forceful man who made a success of life, and added to his land holdings until at one time he owned about one thousand four hundred acres of choice land.